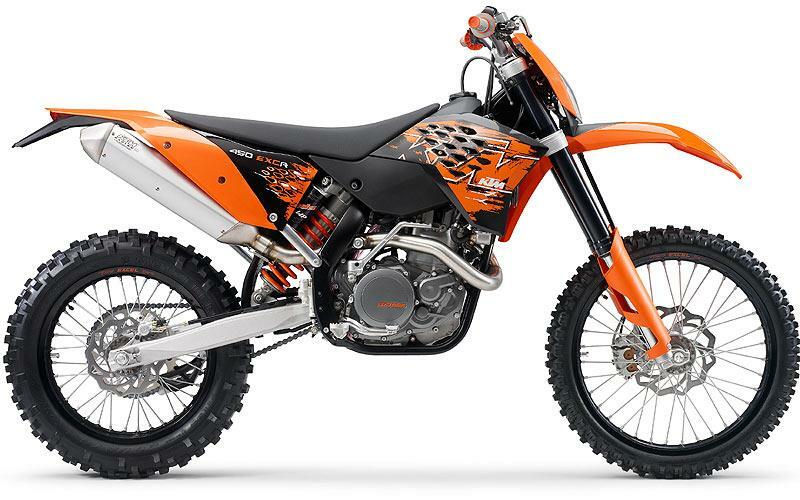 KTM has revealed the first of its 2008 model year machines in the form of a completely revamped EXC enduro range. The bikes, which include the 125, 200 and 250cc EXC two strokes, the big 300cc EXC-E stroker, the 250 EXC-F four-stroke and the range-topping 450 and 530 EXC-R four strokes, have all been given new frames and engines. The chassis mods include new frame tubes, a new swingarm design, lighter wheels and a revamped cooling system, plus new bodywork. Engine-wise, the 125 gets a new piston, engine casing and ignition. The 200 and 250 two strokes also gets the changes to the cases and ignition, with a new CDI unit. The 300 EXC-E gets an electric start, new cylinder and crankshaft plus changes to the crankcase and ignition, with two switchable ignition curves. On the four-stroke bikes, the big news is the new 450 and 530 four-stroke motors. The SOHC, four-valve XC4 motor is lighter than its predecessor and features an electric start as well as a kickstart. Prices and availability will be announced soon.